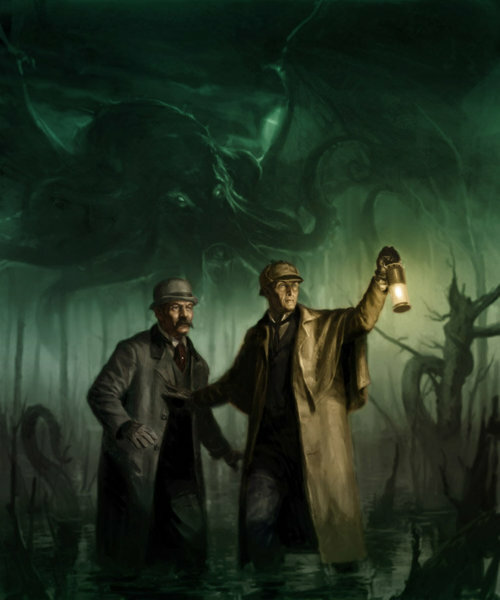 So Neil Gaiman, the great author of dark fantasy, apparently wrote a short story about Sherlock Holmes meeting Cthulhu, H.P. Lovecraft’s giant ancient alien monster. Last week I had a few minutes between classes on different campuses, so I swung by the library. The start of a school year always puts me in the mood for easy genre fiction, and right now I’m hankering for Lovecraft. Browsing the shelves I saw a recent anthology, an homage to the master. Picked it up, flipped through it, found this one. It was just as excellent as any Gaiman fan might hope. I was extra delighted to find my own name in it, in a reference to “Huston, the acid-bath man,” some sort of thoroughly homicidal type, it seems. It’s available in a few places online, most attractively here. Highly recommended.